You are here: Home › News and Updates › Help Kevin “Rashid” Johnson Get His Property! Email Top Prisoncrats in Indiana and Virginia! 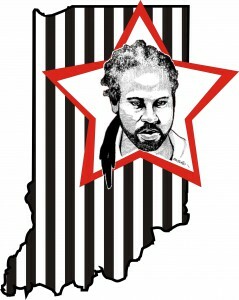 ← Kevin “Rashid” Johnson is Still Being Denied Access to His Property! At this point, we are asking people to redirect their energies directly to the higher-ups at the Indiana and Virginia Departments of Corrections. Indiana, because that is where Rashid is currently being held. Virginia, because he is a Virginia prisoner, who is only in Indiana under something called the Interstate Corrections Compact. He was transferred from Virginia to Indiana in order to break his ties with supporters and isolate him further, however legally Virginia remains responsible for him and for seeing that his rights be respected. I am writing you regarding Kevin Johnson, a Virginia prisoner (Virginia DOC#1007485) who has been transferred to Indiana under the Interstate Corrections Compact (Indiana DOC#264847). Since Mr Johnson has been in Indiana, he has not had proper access to his property. When he requested certain documents, he was instead given a box and a half of what seemed like randomly selected items. He has not had access to legal materials that he needs for ongoing and anticipated court cases. He has not had access to addresses and phone numbers that he requires, in some cases to keep in touch with people he knows, in other cases to meet deadlines for litigation. Mr Johnson has attempted to resolve this issue with staff and Pendleton Correctional Facility, to no avail. Concerned parties on the outside have also contacted prison officials, and have been provided with both inaccurate information and outright untruths regarding the situation being resolved. That is why we are now writing you. Being a Virginia prisoner transferred under the Interstate Compact, Virginia remains responsible to seeing that all of Mr Johnson’s rights are respected, including his right to access his property, including but not limited to his legal property, within a reasonable period of time. It has now been almost three months that Mr Johnson has been in Indiana with no such access. We ask that you rectify this matter, and inform us of how this situation is to be resolved. Please also take a moment to email Indiana Commissioner Robert Carter and Deputy Commissioner James Basinger, as well as Indiana Governor Eric Holcomb. Since Mr Johnson has been in Indiana, he has not had proper access to his property. Currently at Pendleton Correctional Facility, when he requested certain documents, he was instead given a box and a half of what seemed like randomly selected items. He has not had access to legal materials that he needs for ongoing and anticipated court cases. He has not had access to addresses and phone numbers that he requires, in some cases to keep in touch with people he knows, in other cases to meet deadlines for litigation. There are serious concerns about the competency, and also the integrity, and Corrections Officer Dale Davis, who has been in charge of the property room at Pendleton for 8 years now. Being a Virginia prisoner transferred under the Interstate Compact, Virginia remains responsible to seeing that all of Mr Johnson’s rights are respected, including his right to access his property, including but not limited to his legal property, within a reasonable period of time. He is not asking to have his property in his cell, nor is he asking for any special rights – only to have access to his belongings as according to IDOC regulation 02-01-101. It has now been almost three months that Mr Johnson has been in Indiana with no such access.